Plans for a new crematorium in North Kesteven have been rejected by councillors. South Lincolnshire Crematorium and Lincolnshire Co-op wanted to build the new facility on land west of Haddington Lane, near Thurlby, claiming it would help with a lack of capacity at a facility in Lincoln. However, the City of Lincoln Council objected to the proposal, and denied there was a lack of capacity at their facility. North Kesteven District Council officers also criticised a lack of evidence and ‘unsubstantiated claims’. Councillors agreed the site was not in an acceptable location and would create issues. Coun Marianne Overton said she continued to believe a need for such a facility was “very much towards Sleaford. The proposals included a single storey building which ‘bears many similarities’ to one the applicants already own in Surfleet. It would have been accessed via Haddington Lane, and would include an 85 space car park, gardens and landscaping. Andy Bowser, director of applicant South Lincolnshire Estates, said the facility was needed. He said 10 other sites had been considered and argued that a site closer to Sleaford would not be viable. “We think it’s a lovely, peaceful tranquil setting and will benefit the bereaved very much,” he said. The applicants argued another new crematorium near Lea, Gainsborough, would not “substantially” change the numbers going to Lincoln. The Lincoln facility, on Washingborough Road, underwent a refurbishment in 2018 which improved the seating capacity and size of the building, along with creating a new entrance and offices. Simon Walters, from the City of Lincoln Council said the facility had the potential for future expansion. Earlier this month, further multi-million plans were approved by City of Lincoln council’s leadership including new cladding, grounds, a book of remembrance, parking and a new rose garden. 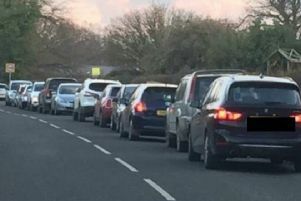 Meanwhile, The Standard previously reported last year that NKDC was continuing to develop its own plans to site a new crematorium in the Sleaford area to serve local need and reduce travel time and distances for mourners. This may be run by the council as an income stream as funding cuts bite, or in partnership with a private organisation.